It snowed all day yesterday. I wouldn't characterize it as a "pounding" as had been predicted. 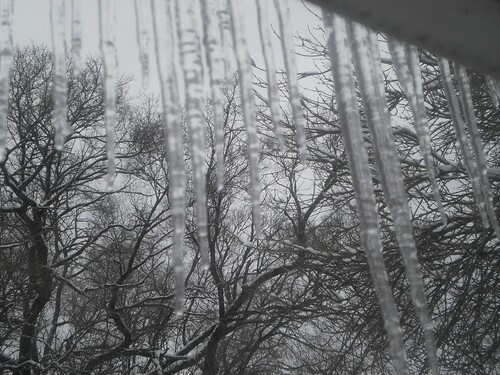 It was a beautiful, gentle snow, a Christmas snow. I went out about 10 p.m. to see what I could capture with the camera. Most of the photos are blurry. This is the best. The city plow was going by on the left. Our neighborhood put up luminarias on Christmas Eve. We've been doing this for, gee, I don't know how long. The couple who have organized this have their house for sale now so this may be the last year unless someone wants to take it over. 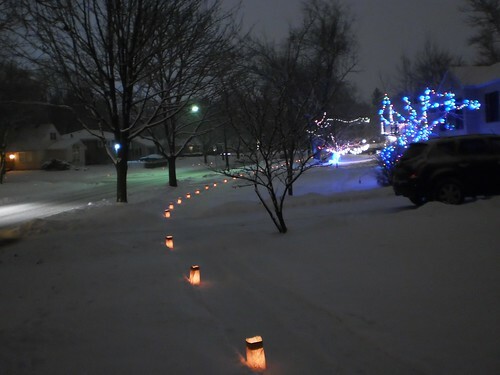 A non-profit sells luminarias every Christmas. It's their big fund-raiser. You just have to supply the sand or other item that goes in the bottom to hold the candle and anchor the bag. When we did it, I would use kitty litter. It was a lovely, still, quiet evening. Someone was piping Christmas music into the street which kind of seemed surreal, but I just stood for awhile and listened to the sound of falling snow. Today, it's been quiet too, with little street traffic. You could hear the sounds of snowblowers occasionally. It's warm that had I decided to shovel, the walk might have cleared. But I decided to just let the snow be. It's warm enough that it's melting. It's always so dramatic with the black lines of the trees and the white of the snow and the sky. There will be time enough tomorrow to resume life. It's enough today to just be.